Beautiful and warm weather arrived a few hours before a storm. 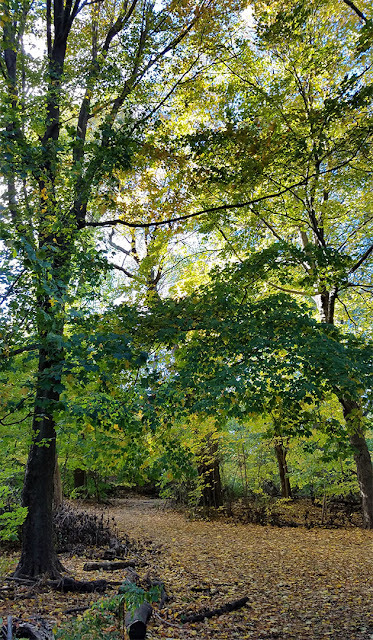 I was leading a small private walk in Prospect Park (a birthday gift from a London sister to her Brooklyn sister, who brought a couple of friends). We met at Grand Army Plaza and walked south. 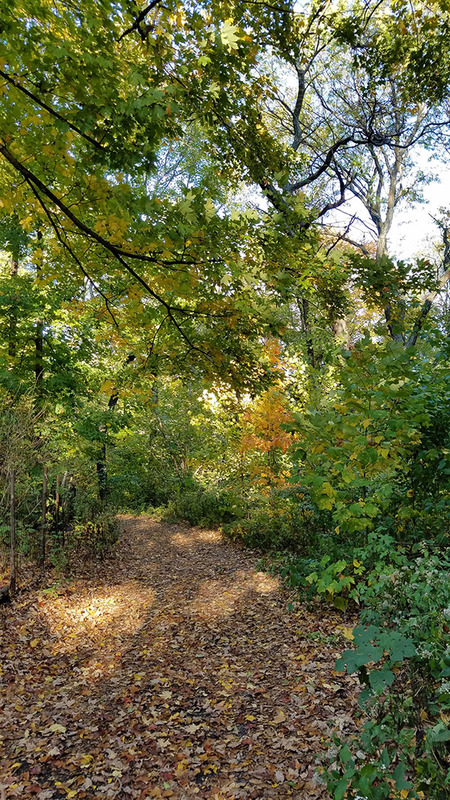 Leaves are falling, but there is still a lot of green in our urban woods. I was hoping for mushrooms, of course; with little rain it has been a lean October, but we had a good soaking a few days ago. And then a telltale sign of good things to come. Honey mushrooms (Armillaria spp), well beyond their prime on a dead tree (they killed it, it's what they do). Look beyond the tree's stump and you may find a newer, firmer, fresher generation, matching the leaf litter perfectly. 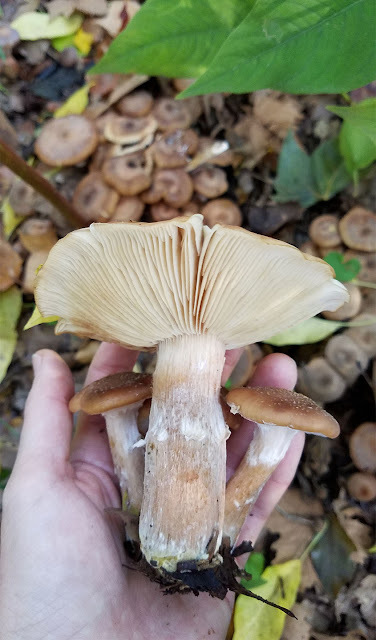 Honey mushrooms have white a spore print. And that does not imply that any mushroom with a white spore print is good to eat. No. But in the case of a possible "honey" ID you want a white spore print; one of its potential lookalikes - which is toxic - has a brown spore print. Please join a local mycological society if you would like to learn more about mushrooms, and especially about eating them. And then on, happily, to larger things: giant puffballs - Calvatia gigantea. Like huge softballs on the dead leaves, they were a little nibbled, but in prime condition. Our party of four split the largest and firmest very happily, and we left the others (on the walk home I noticed a couple pouncing on one of the ones we'd left behind). There is little need to be greedy with puffballs - one big 'un can feed you for days. 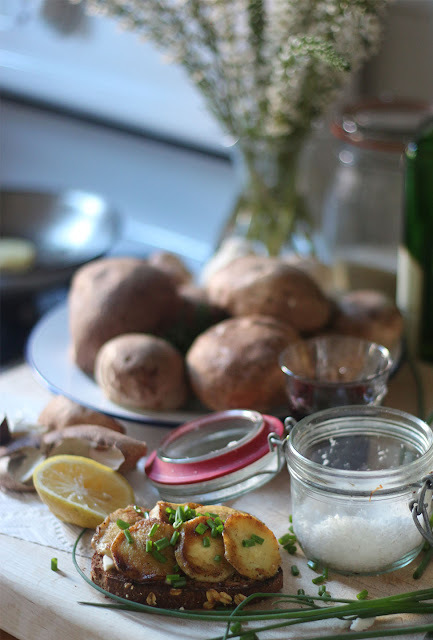 The texture inside is like tofu, or melted haloumi cheese, or roasted bone marrow, but mostly like puffball. They grill beautifully. 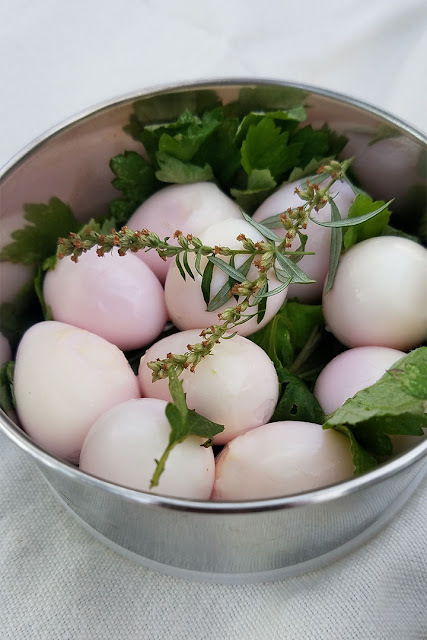 We stopped for a picnic of pink quail eggs and mugwort dipping salt and a dessert of spicebush-poached pears. Hot hen of the woods soup, inbetween. Some people had dessert first. Which is what being an adult is all about. And then it was home, again, through the trees. It was summer-warm. Everyone was in the park. 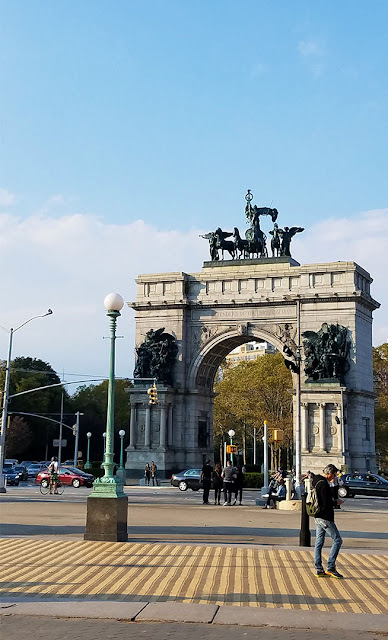 I collected my bike at Grand Army Plaza and rode home, downhill almost all the way, the wind in my hair. 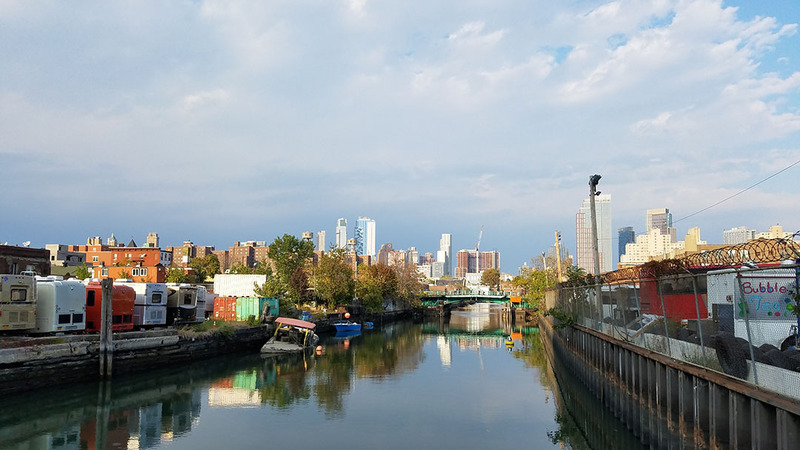 I stopped for a minute on one of the bridges over the Gowanus Canal. I think the Superfund cleanup may have begun. There are yellow floating devices along its length that seem to be measuring something (maybe they just melt when it's all too much?) and I saw people in head-to-bootie hazmat suits on a barge, recently. They looked tired. At the far end beyond the second bridge, white foamy gunge continued to gush into the waterway. 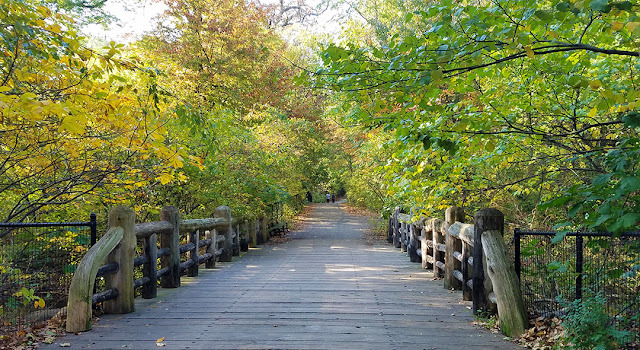 Puffballs and picnics and autumn and toxic waste, all in one day. Monday Update: And, TICKS. I was bitten by a damn deer tick. In Brooklyn. Hopefully there will be no more to report. Yes, I am fully informed. 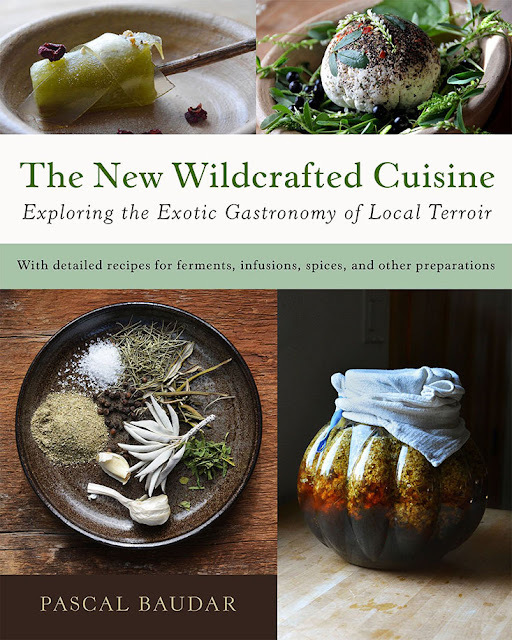 I have written a review of Pascal Baudar's The New Wildcrafted Cuisine for Gardenista. Please head over there to see and read more (and to enter your name for a giveaway of the book). I have known Pascal online for years, as we hang out in the same digital foraging places. Attending one of his wild foods classes in the wilds of LA is high on my wishlist. 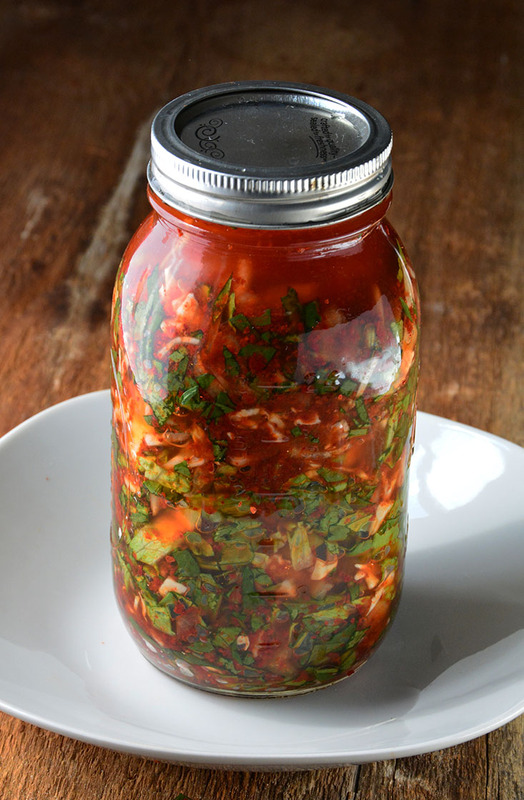 Wild kimchi is one of dozens of interesting recipes included in his beautiful book. 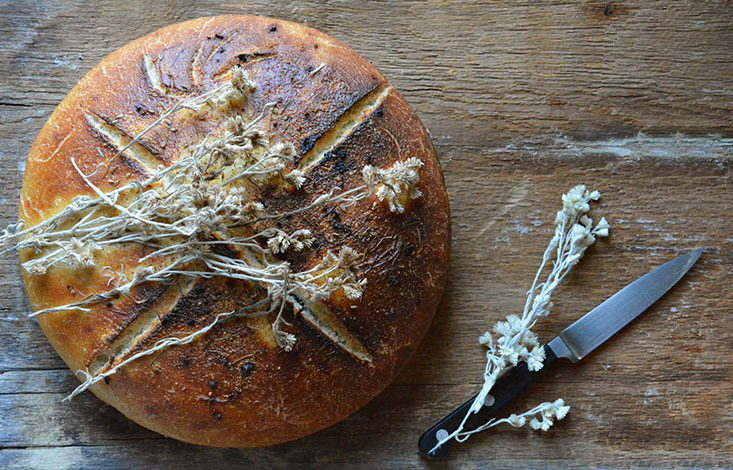 Sourdough baked with wild elderberry starter, fermented green elderberries, white fir soda, his concept of Drink the Forest (now appropriated by every forager out there, I think), how to make wild mustard and vinegar, cooking with cattails, pickling mushrooms, baking trout in clay and shrimp in tree bark, creating wild spice blends, food preservation techniques... It's a thrilling book. 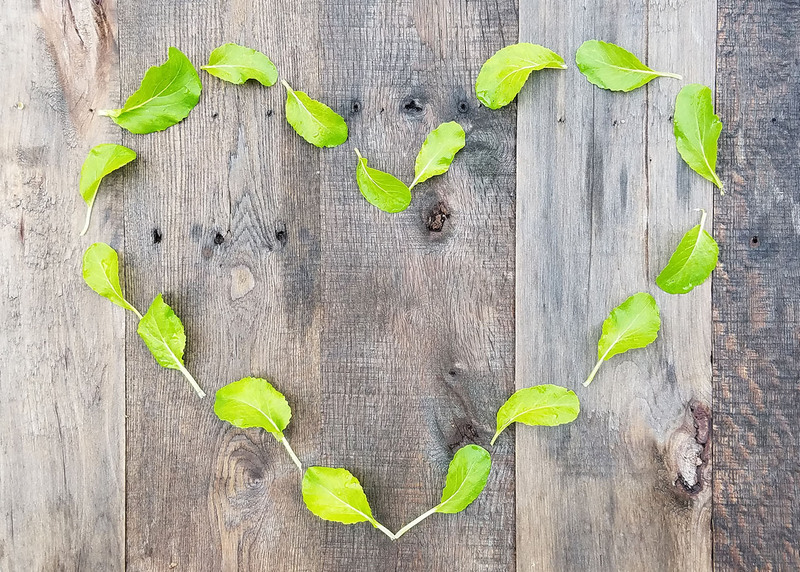 I Heart Grow Journey. Made from 'Prize Choy' bok choy leaves, planted a few weeks ago. I know my bok choy will not make big boks, because they are now very shady. But I like the little boks. I mix them into salads or add them at the last minute to Asian curries for a swirl of dark, anti-oxidant green. My fall greens are giving us daily salads and side dishes. Interestingly, one crop that has not done well is the red chard. It is in a super-shady section of the vegetable plot and I think I just pushed it over the edge, or simply planted it too late. Or maybe the seedlings don't like being stamped by little possum feet. The arugula right beside it is just fine. 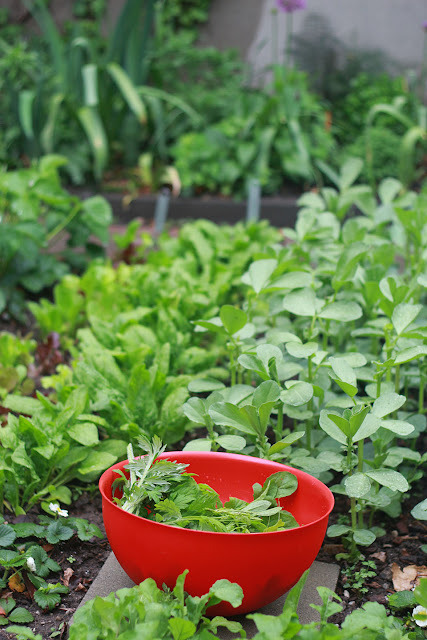 As I wrote in my piece about edible shade gardening for Gardenista recently, arugula is the Obama of the shade garden. It germinates quickly and reliably and grows from spring through summer and well into the cold nights. Its leaves are always in great shape. 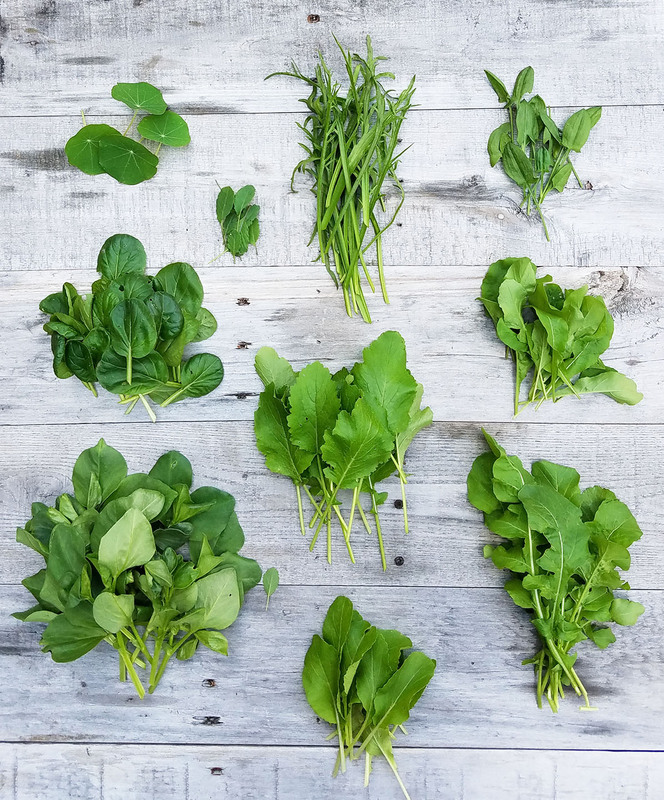 You can count on the arugula not to disappoint. Also, it looks good. 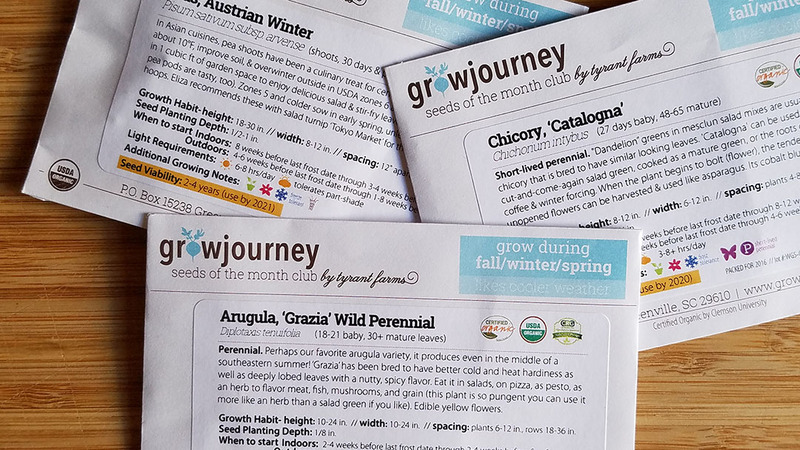 In my most recent seeds of the month package I received a wild arugula cultivar, 'Grazia.' I am very curious to see whether it will germinate better than another wild arugula cultivar I tried from Botanical Interests earlier in the year. That one had an abysmal germination rate, in each of three sowings. Like, 5% (I'm not knocking Botanical Interests - I seed from them every year). 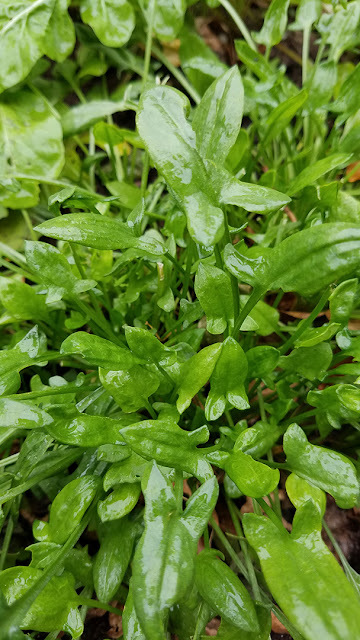 Regular arugula is actually a different plant - Eruca sativa. Wild arugula is Diplotaxis tenuifolia. Plant now? Our first frost date technical falls this week. I think I will, as wild arugula tolerates colder soils. The peas and chicory I am going to hoard for early next spring. Hopefully the yellow leaves on the black locust will be allowed to lie a while. A bountiful October collection of persimmons (Diospyros virginiana), acorns, puffball (Calvatia cyathiformis), field mushroom (Agaricus campestris), and young maitake (Grifola frondosa). The mushrooms became soup, for a forage walk. I am in the process of stringing up the harder persimmons to make hoshigaki, air-dried persimmons, a Japanese delicacy. This involves peeling them, quite a fiddly commitment with these small indigenous fruit, and hanging each one up to dry for several weeks. After they start drying they are massaged daily to distribute the sugars more evenly. 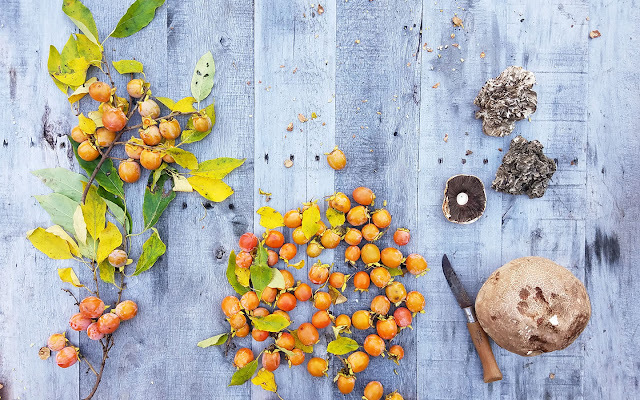 Aside: I'd love to travel the Japanese countryside, eating, foraging. The acorns. Yup. I collected a test amount, nice and dry and no insect holes, to try my patience even more: to candy them, chestnut-style. Suggested to me by Renee Baumann, a chef who came on my last forage walk. I left my forage collection on the outdoor table overnight, in the cool temperatures. The next day...What was I thinking? Missing: Every. Single. Acorn. The squirrel/s had eaten and buried every last one. Acornfest. The vegetable plot was extra-riddled with holes. They liked the persimmons, too. Sigh. So I must go back for some more. Scheduled forage and plant walks have come to an end but I will lead private walks as long as people want to go on them. Get in touch to book via the Find/Follow tab. 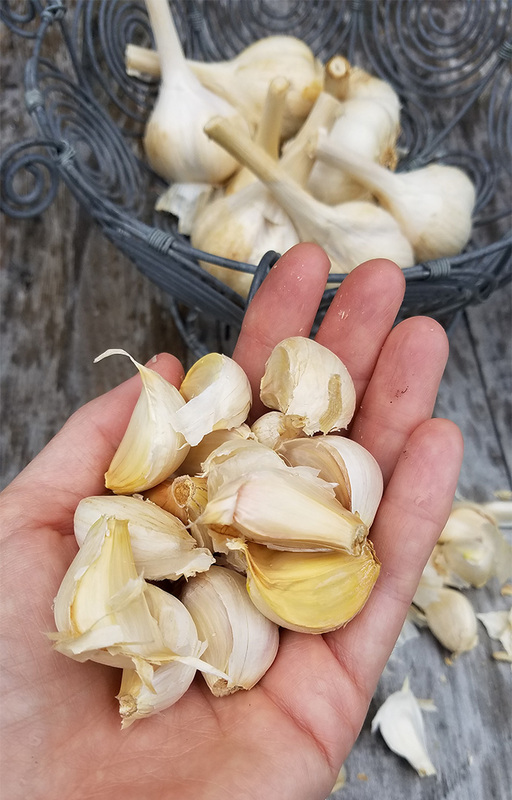 It was very satisfying putting together this list of edible plants that can grow in shade, for Gardenista - my answer to a reader's plea for help. There were more than I thought. In the garden new garlic is sprouting, the self-seeded mâche is up, very late season fava beans are leafing out, the arugula keeps on trucking, and the squirrels are in an acorn digging frenzy, tipping over my Italian dandelion plants and uprooting baby kales. I inadvertently contributed to their stash, and for the squirrels Christmas came early, More about that, tomorrow. The sun has left our garden altogether, now, and while I have always loved seasonal changes, I am bracing myself for the dark months ahead. 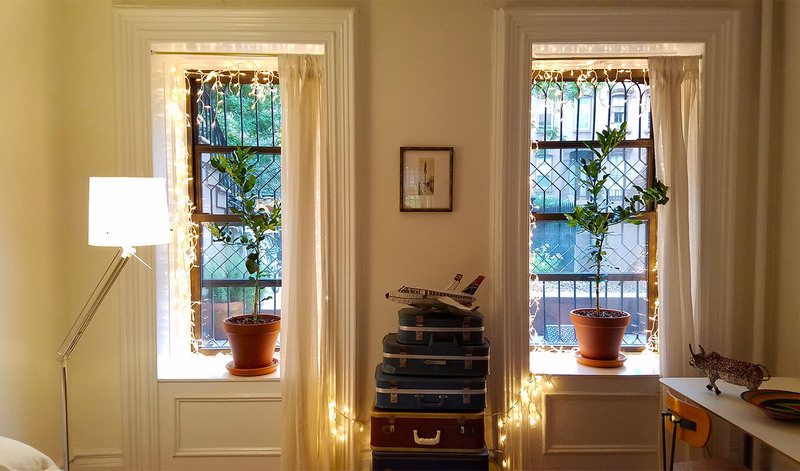 Indoors, my work spot will shift soon from the darker living room to sunny bedroom, where the two Thai limes are in the windows, soaking up the rays. I have found signs of scale on them, probably a pest they brought with them from Tennessee, and which I never noticed when they were outside. I have been spraying them with Neem oil. They will be indoors through April. Which seems very far away. 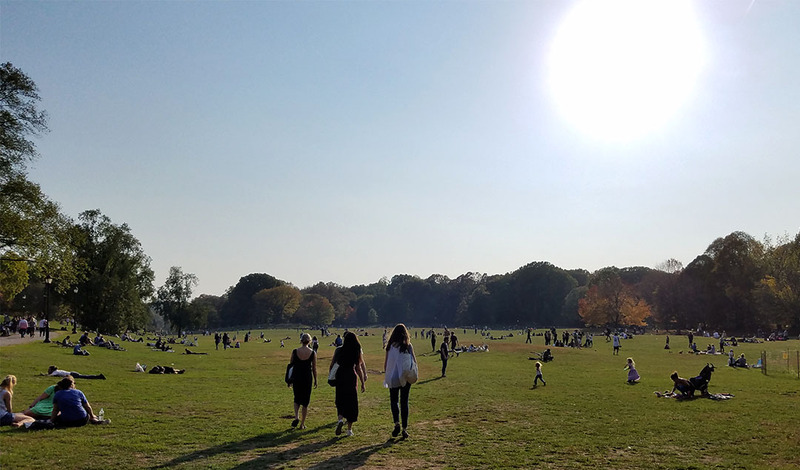 Earlier darkness or not, New York is destined for record high temperatures, today. Mid October's nip has melted to a balmy 88'F. (Oh, hi, Global Warming!) 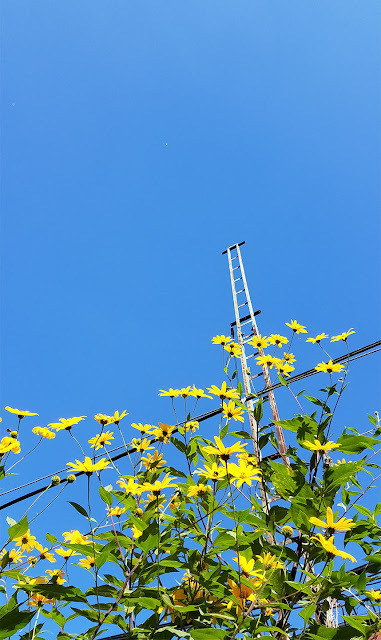 And my mosquito bites, acquired in the line of gardening duties, tell stories of high summer. I have been planting garlic and lifting lily bulbs. And maybe I will order more bulbs for spring. 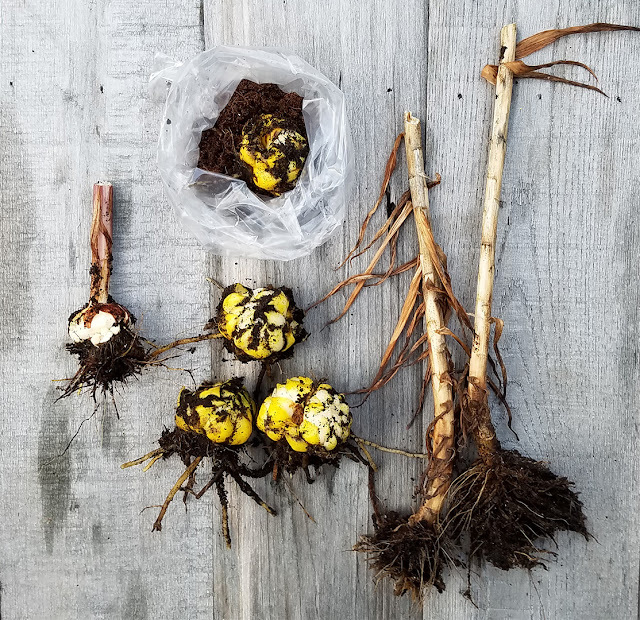 Read about some other autumn garden chores in my story for Gardenista. Last fall I dug up a root of sheep sorrel in the Catskills and brought it home to the fledgling vegetable plot in our newly weeded garden. It is a wild edible plant I see rarely in the city (the exception is Green-Wood Cemetary, where it likes the lawn. It is a European import, and a miniature version of the garden sorrel that is sometimes called French - Rumex acetosa. Sheep sorrel is Rumex acetosella. A year later it is very happy. Very, very, very happy. In our newly cool weather it has put out a spurt of fresh growth and I know I will have to dig around it again soon to chop of any runners it has sent out. It is called a weed for a a reason, but I am happy to have it. I pick it often. It is very good melted in some hot butter or cream for a sauce and is sour enough to stand in for lemon in salads. 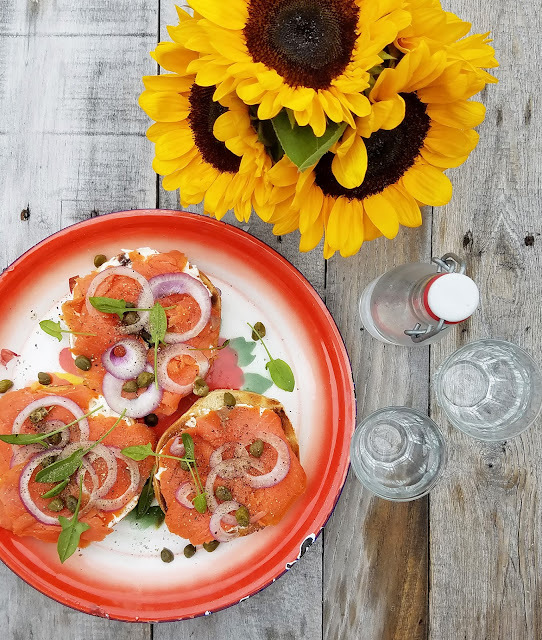 It always tops our Sunday bagels. The last scheduled forage walk is this Saturday, but I have several private walks still ahead. Get in touch if you'd like to arrange one of those. 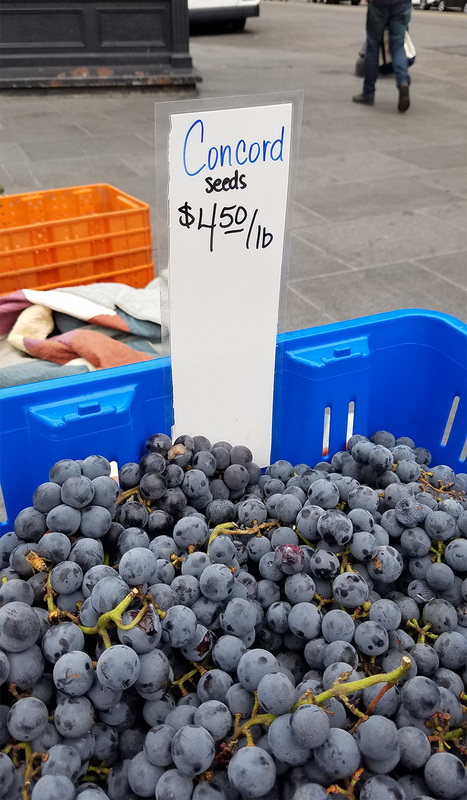 I hope these grapes appear at the Borough Hall Greenmarket for another few weeks. This is their season, and I wait all year for them. I love Concords, and their green cousins (name forgotten) and Jupiter and Mars - these real grapes with interesting flavours. I can't bear supermarket grapes. Hard balls of one-dimensional sugar. I think it's funny that the signs says "seeds." The seedless grapes cost a dollar more. I don't know why seeds have never bothered me. Recently I was re-reading Return to Camdeboo, by Eve Palmer. She grew up on that farm in the Great Karoo in South Africa, and writes about the food that was grown and eaten there, that was cooked there, in old fashioned and then modern kitchens, over generations. And part of the book is lengthy excerpts of letters written to her by her sister-in-law, mid-late 20th century - farm chores, glut, canning, weather. Lots of weather. 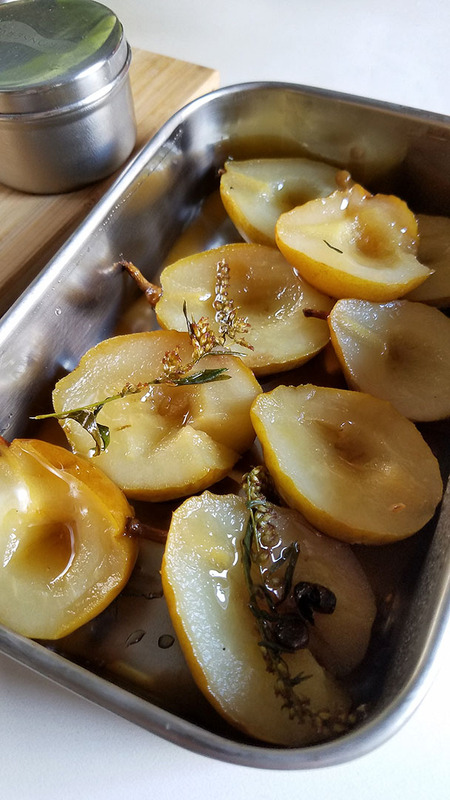 Eve Palmer's father was passionate about fruit-growing and made a ritual of presenting the harvests, from the kitchen gardens, of each fruit as it ripened. She writes about grapes, about the care taken to protect the bunches from wasps and birds, the cloth bags that covered each bunch, and which were washed and pressed for use the following year. The differences in taste, perfume and appearance. The lineage of the fruit. In Cape Town, there are hanepoots (Muscat d'Alexandrie) in late summer, pale brown and intensely scented. I am giddy about them if I am there at the right time. I hunt them down. They are rarely in shops, mostly sold at the side of the road, if you know where. But here, in October, it is the Concord-and-clan season. I like to eat them cold, so I rinse the bunches and keep them in the fridge in a wide China bowl, and take one after dinner. and then another. And sometimes a third. 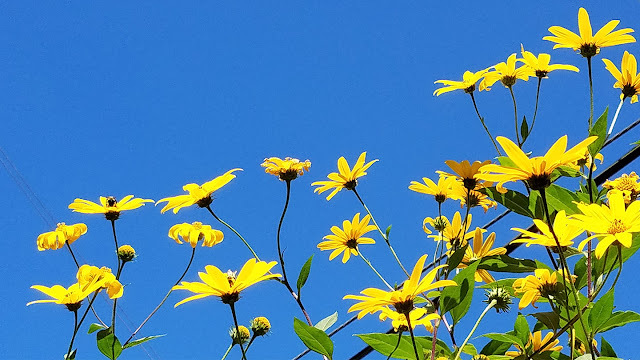 Helianthus tuberosus, a North American vegetable. Planted from some supermarket rhizomes. About 12 feet tall and listing a little. I love them, but will dig them up and move them over a little once the flowers die back. 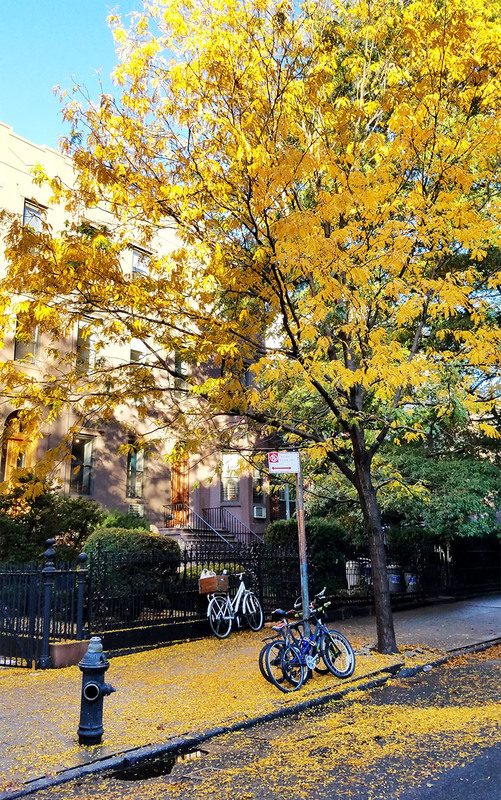 October can be a good foraging month in New York. 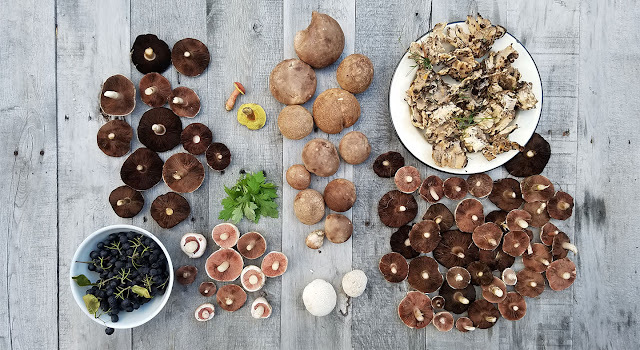 Field mushrooms: the dark brown ones top left as well as the pink ones beside the berries and the medium brown ones, bottom right - all Agaricus campestris (campestre means field), at different stages of maturity. These are very closely related to the button mushrooms you buy in shops. And not the most simple mushroom to identify, as I discovered some years ago, but there are good and obvious ways to to tell it apart from mushrooms that could make you sick. The baked potatoes in the middle? 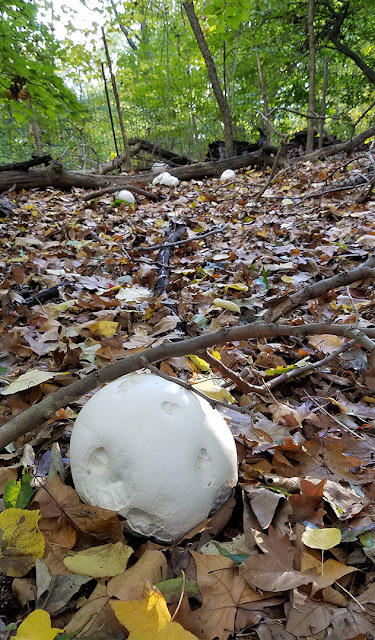 Edible puffballs, Calvatia cyathiformis. They are similar to silky tofu or bone marrow, depending on your dietary preferences. Below them a species of Lycoperdon, not identified, yet. Top right, immature Meripilus sumstinei - black-staining polypore. The two little yellow ones - a bolete, but waiting on ID. I had some puffball slices on toast for lunch. Chives from the garden. Delicious. 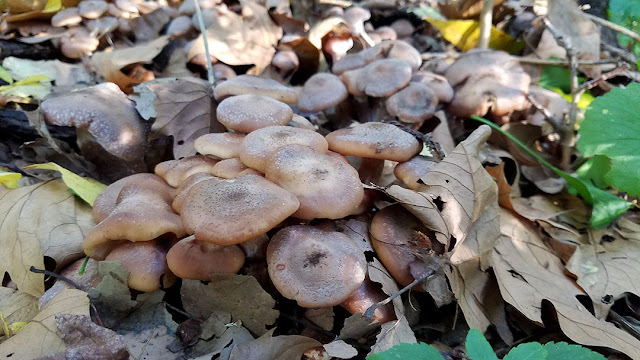 Come and learn about such fungal critters and edible plants on forage walks this Saturday in Central Park, or next weekend in Prospect Park. 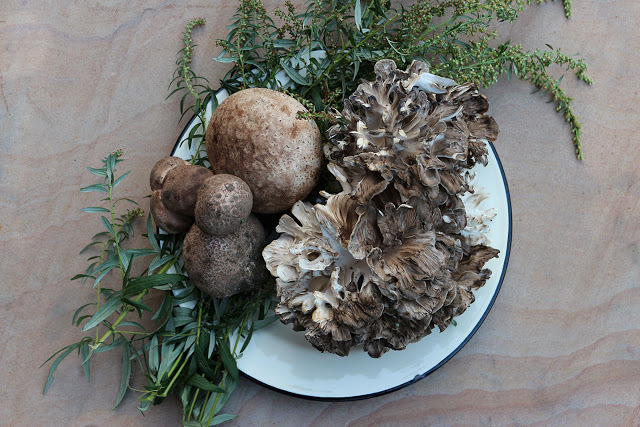 Yes, there will be mushroom soup (hen of the woods). No, it won't kill you. Autumn in Prospect Park can mean mushrooms, if we're lucky, and rain and temperatures cooperate to create the right conditions for fruiting. 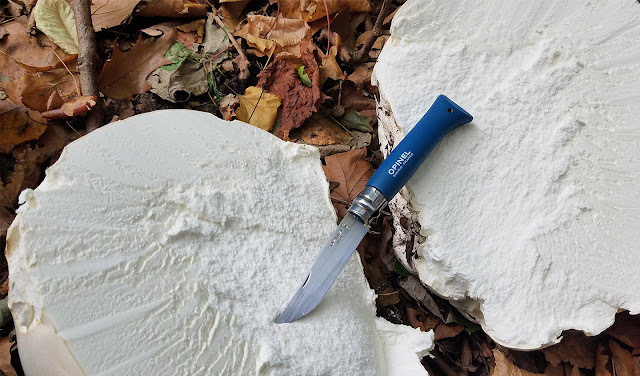 In no way do I consider myself a mycologist but I will teach you the do's and don't's of safe mushroom foraging, what to look for, and where. 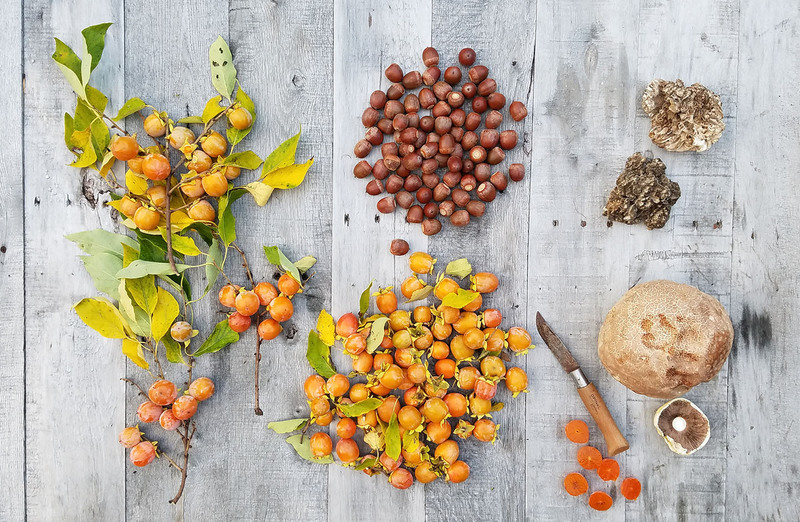 The happy thing about a plant walk is that mushrooms (fungi, not plants) are a pure bonus; there are plenty of edible or aromatic plants to keep us occupied, from indigenous Sichuan pepper (yes, it exists) to nuts, herbs and fruit. Our stroll leads us from the western side of the park right across towards the east, with a hill in the middle, with a picnic en route. More details will be emailed to confirmed walkers in the week leading up to the walk. I moved the makruts (Thai limes) to our bright bedroom windows about a week ago, as overnight temperatures started falling below 60'F. They look very healthy and will have to be transplanted to deep pots, next spring, and later I will be pruning them to stay small. I use the leaves, of course, but fruit would be a wonderful bonus. If you've never smelled the bumpy-textured, green, fresh limes you're in for a treat when you do: intensely aromatic and very different from the grocery store Persian limes that we buy day in, day out. "Kaffir" is a chilling word for South Africans; in South Africa it is a racist slur (still) used by some racist people to refer to black or brown people. America has the n-word. South Africa has the k-word. Still known as kaffir limes in many homes and listed as such by many businesses and on menus, the enlightened and informed are calling Citrus hystrix either Thai lime, or makrut - both appropriate (and time-honored) names. Above: to open a box that says this is startling. 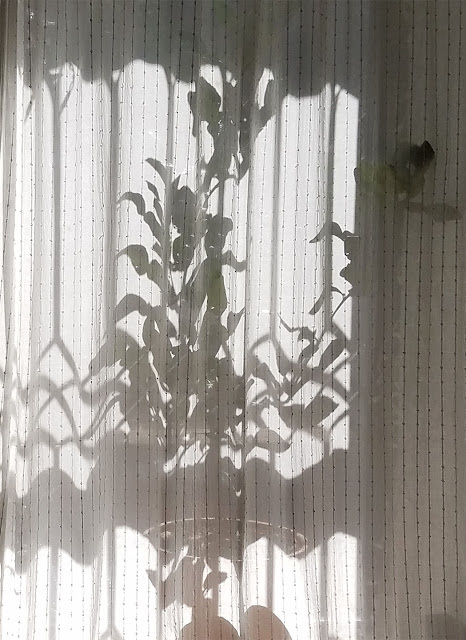 Not one of my attempted reviews - 5-star for plant quality, packaging, speed of delivery, but with this one criticism - was published on Amazon, where I bought the trees. So I left a question about their name on Amazon: "Are you aware," blablabla. The same night the grower called me, to my surprise. I felt he responded positively then, as well as in a later follow-up email, from support@lemoncitrustree.com. I directed him for reference to the useful Missouri Botanical Garden's Plant Finder website, which is up-to-date in terms of this information. Modern Farmer published a short piece about the offensiveness of the name two years ago. The Oxford Companion to Food lists the tree under M for makrut, with full explanation under the letter K.
But after four weeks neither the Amazon listing nor the grower's own website, Lemon Citrus Tree, reflects any changes at all, which is disappointing. 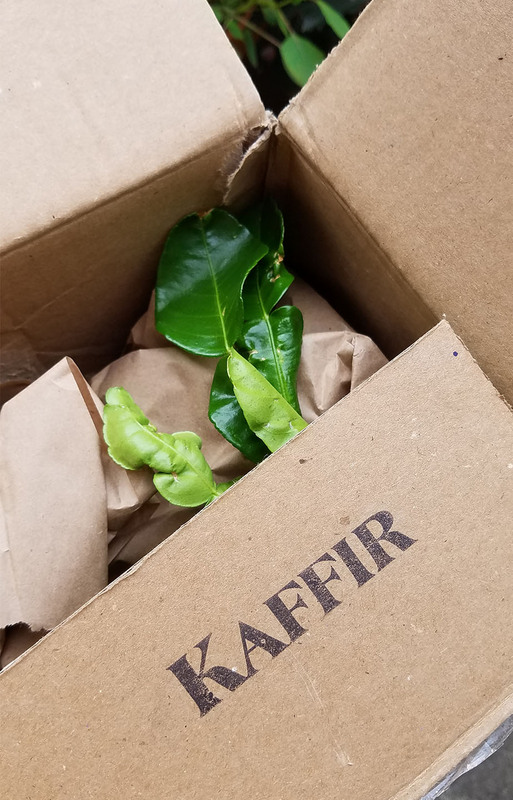 From a seller's point of view there is an issue: potential customers searching for a k-lime will not land up on a site selling Thai lime or makrut. And an American sale will be lost. But the marketing gods are in the details, and there are ways around this. The least I expect is a short explanatory paragraph. That would be the right - and very easy - thing to do. If you find a lime sold as "kaffir," anywhere, carry the torch, and speak up. 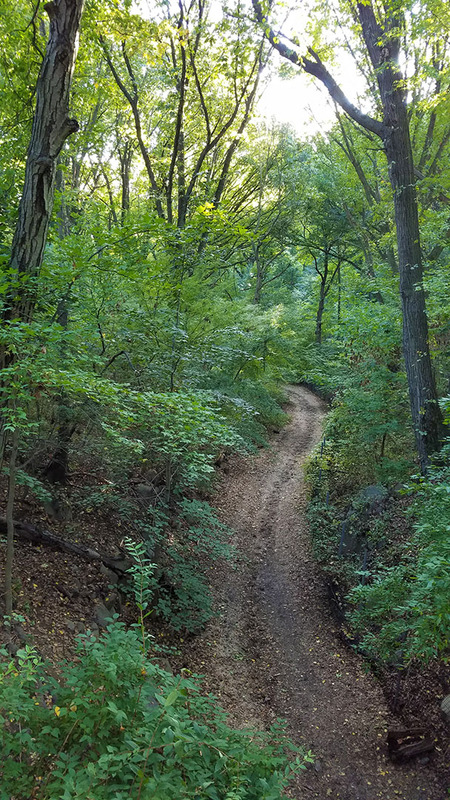 In other non-news, there are still spots left on this Saturday's wild North Woods forage walk. 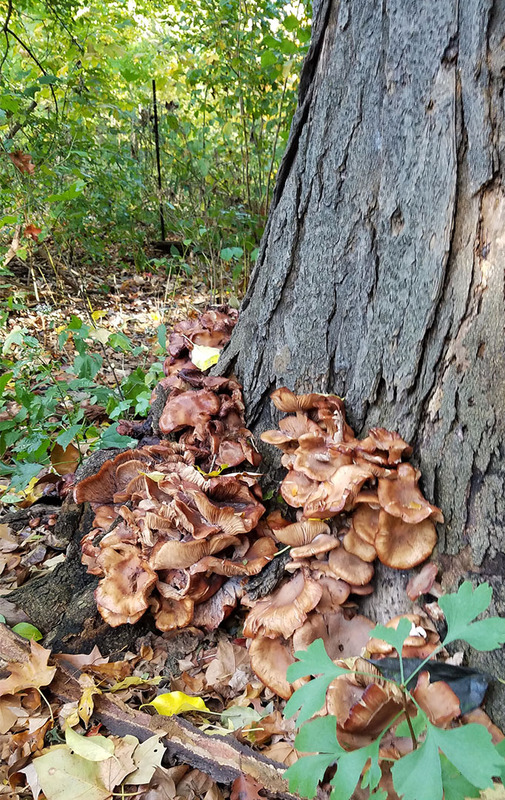 Hen of the woods soup is on the menu. Booking info in the link below.